FLEXLUX offers a unique feature. The integrated Air Channel Technology for your ultimate comfort. Integrated Air Channels allow your chair to breathe by letting air circulate through the chair – helping you stay comfortably seated for hours. In the leather chairs, you will find perforated leather, to ensure this unique breathability. The innovative Air Channels ensure long-lasting comfort without compromising on breathability. The Air Channels have been designed to keep you comfortable, no matter what season it is. 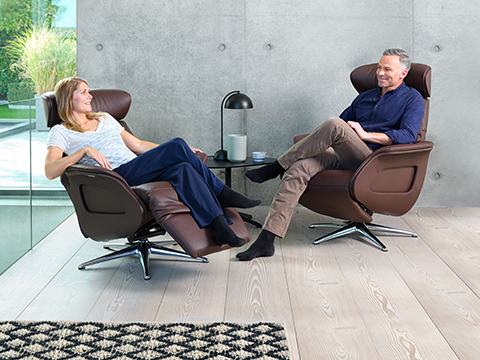 The integrated Air Channels will transport air into the back of the chair, keeping it ventilated and the perfect temperature for you – keeping you warm in the winter and cool in the summer. The Air Channels will guarantee you outstanding breathability. This unique Technology offers you long-term comfort and well-being. FLEXLUX – The pleasure of being.